It’s possible to have a life on mainland Australia, as I’ve discovered, but some adjustment is necessary when summer comes around. Heat doesn’t agree with me. When I lived in other places the thing I missed most was a breeze with a hint of ice in it. For me, that’s Tasmania, and it’s one of the reasons I finished up back here. If there was habitable land 200km further south, that’s where I’d be. So a current Australian book called Four Degrees of Global Warming: Australia in a hot world (Routledge, 268 pages) wasn’t exactly ideal summer reading for me. In last week’s weather, just looking at the book’s cover felt as if it would bring on a heat rash. 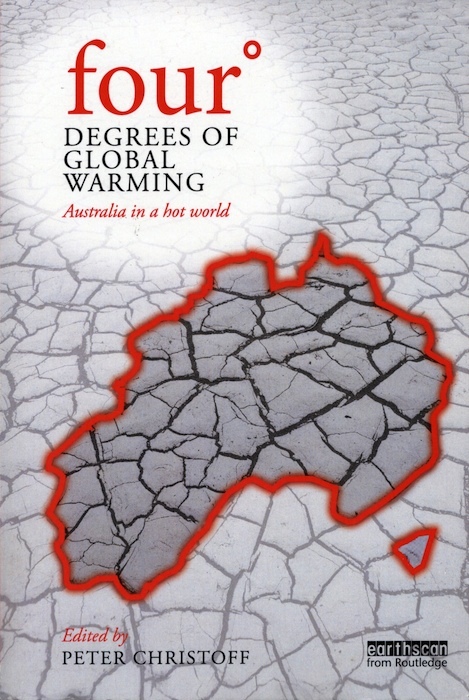 Edited by Melbourne political scientist Peter Christoff, the book’s 29 contributing authors include 16 of the country’s top climate scientists, seven leading specialists in energy, adaptation and population, and six prominent figures in political studies, geography, economics and the law. This is not your standard global warming polemic, pro or con. It’s the outcome of years of research by people who have spent their professional lives examining what’s happening to Australia’s climate, how it might affect its inhabitants (human and non-human), and what we can do about it. The title deserves some explanation. We’ve heard much of the 2C warming threshold, after which things get really sticky, and in 2010 at the UN climate summit in Cancún, the world’s nations, including Australia, committed to doing what’s necessary to prevent us reaching that point. But commitment and reality parted ways long ago. A 2012 World Bank report concluded that in the likely event that the commitments won’t be met, there’s a near-even chance of the world being over 4C warmer by 2100, and a 10 per cent chance of this happening by 2070. These possibilities are horrendous to contemplate, not least because this wouldn’t be the end of it. Our climate system responds slowly to rising greenhouse gas concentrations. The World Bank report points out that 4C of warming by 2100 would inevitably become 6C some time after that. Last week the Organisation for Economic Cooperation and Development reported that despite some progress the world is headed for a catastrophic 4C of warming by 2100 if not sooner. A persistent reliance on coal power and a big rise in car ownership globally is driving rising emissions. As Christoff says in his introduction to the book, a world warmed by 4C “is one of almost unimaginable social, economic and ecological consequences and catastrophes”. Multiple models cited in the book indicate that 4C of warming will see average rainfall drop by half across southern Australia (though not Tasmania) and alpine snow cover drop to zero. With seas 1.1m higher, many popular coastal areas would be permanently inundated. Extreme weather modelling used in the book revealed that with 4C of warming, by 2070 Hobart can expect more than twice as many days of heatwave conditions (above 35C) in a year than today. But our problems pale into insignificance alongside Melbourne (nine heatwave days today, 26 by 2070), Brisbane (from one today to 21 in 2070), Cairns (4 today, 96 in 2070), and Darwin (11 heatwave days today but rendered uninhabitable with 308 heatwave days a year by 2070). The modelling indicates that heat-related deaths would be triple 1990 levels. With food production in the Murray-Darling basin predicted to fall by as much as 90 per cent, food insecurity would become a significant domestic issue. Four degrees of warming would make our current “boat people” issue seen trivial in the extreme. Rising seas, disruptive weather, excessive heat and food shortages would drive millions of people in neighbouring Asia-Pacific countries to desperate measures, including taking to boats. A couple of footnotes since Christoff’s book was published: first, a paper by a Cambridge University team indicates that far from benefiting from more atmospheric carbon, plants in a warmer, carbon-rich atmosphere will actually release more than they absorb from the air. Second, a University of NSW research team led by climatologist Matthew England has produced modelling that says that as the century progresses we’re on track for a doubling of “super El Nino” weather patterns which in the past have produced deep, prolonged droughts in eastern Australia. When news like this gets out, the instinctual reaction of many people, among them politicians and media commentators, is to attack the bearer of the bad tidings. They accuse climate scientists and their advocates of zealotry, extremism or “alarmism”, while pointedly ignoring what they say. But whatever else may be said about it, the Christoff book is a substantial product of research, using all available tools and data, thoroughly referenced and reflecting prevailing scientific wisdom. To dismiss such findings as a mere political statement is arrogant, self-defeating and plain dumb. •THE two most successful agents for climate action in the Tasmanian parliament have been former premier Paul Lennon for his 2008 legislation and Cassy O’Connor, who guided comprehensive “Climate Smart” strategies through a not-always-friendly Giddings cabinet. I salute them both. The new strategies need an engaged government and bureaucracy, but after last week’s tacky events and with a looming election there’s faint hope of that. Nor is there comfort in Lara Giddings taking on climate change after dumping O’Connor. All her energy will go into managing Labor reactionaries and surviving the poll. The March election is set to be a narcissistic free-for-all. Electoral agendas driven by personal ambition, territorial posturing and nostalgia for imagined past glories leave no room for substantial, constructive policy discussion. Everyone is the loser. This entry was posted in agricultural science, agriculture and farming, atmospheric science, biological resources, book reviews, bureaucracy, carbon, carbon emissions and targets, carbon sequestration, cars, changes to climate, climate politics, climate sensitivity, climate system, coal-fired, coastal management, contrarians, energy, extreme events, food, future climate, ice, land use, leadership, oceanography, planning, psychology, public opinion, science, sea level, social and personal issues, social mindsets, Tasmanian politics, temperature, transport, transport fuel, trees and tagged agricultural science, agriculture and farming, atmospheric science, biological resources, book reviews, bureaucracy, carbon, carbon emissions and targets, carbon sequestration, cars, Cassy O'Connor, changes to climate, climate politics, climate sensitivity, climate system, coal-fired, coastal management, contrarians, Darwin, David Karoly, energy, extreme events, food, future climate, ice, land use, Lara Giddings, leadership, oceanography, Paul Lennon, Peter Christoff, planning, psychology, public opinion, Ross Garnaut, science, sea level, social and personal issues, social mindsets, Tasmanian politics, temperature, transport, transport fuel, trees. Bookmark the permalink.